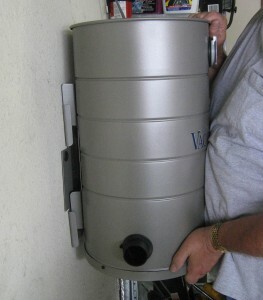 The unit must be mounted within 5 feet of an electrical outlet. Do not use an extension cord. • The unit should be mounted so that it is in a dry location and out of the way, but still accessible for emptying and accessing the utility valves. Suggested mounting: Minimum of 12 inches between unit lid and ceiling or shelving. • Do not install this unit where ambient temperature regularly exceeds 120 degrees F.
• Vacuums must breathe…do not enclose. Be sure to mount 6 inches from sidewalls. *If installing direct from the factory, you will first need to slide the wall bracket out of the unit bracket (packed this way for shipping purposes). These brackets are found on the back of the unit. 1. Find center of stud and mount the wall bracket. Note, the bracket mounts in the middle of the unit, so you will need to mount approx. 3” below your desired unit height. See fig. 1 for more details. 2. Use wall hanger bracket as a template. Use the two vertical holes (approximately 10” apart). Then, mark the location on the stud. 3. Use a 1/8” drill bit and drill two pilot holes for these two vertical holes. 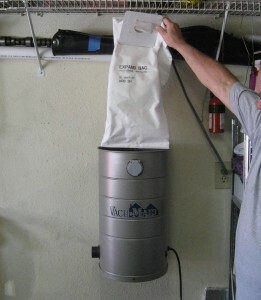 Mount the VacuMaid® Garage Vac by sliding the attached unit bracket onto the wall bracket (Fig. 3) and slide it down until the unit rests securely into the bracket. Mount high enough so you can loop your hose only four times and still clear the floor. *If mounting on a block or concrete wall, drill the holes with masonry bit and insert plastic or lead anchors (not included). 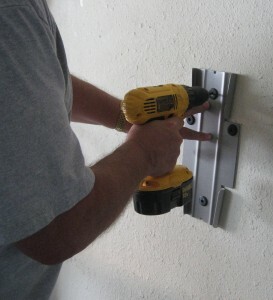 If mounting on plaster, wall board or panel walls, be sure mounting bolts enter studs. Fig. 1 You will need to be able to remove the bag from the top of the unit. Be sure to leave enough room when mounting. Fig. 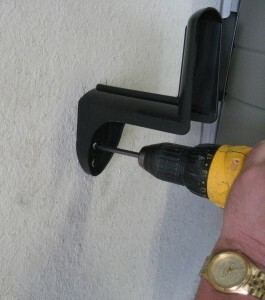 2 Mount the wall bracket. Fig. 3 Slide the unit bracket into the mounted wall bracket. Fig. 4 Mount the hose hanger.